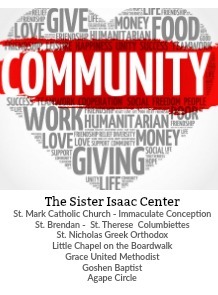 Although the Sister Isaac Center is a ministry of the Basilica Shrine of St Mary, we are helped by many other neighboring churches. St Mark’s, Immaculate Conception, St Brendan’s and St Therese parishes are home to many of our volunteers . St Mark’s supports us generously with funds each quarter; we are able to give extra help to many families in need. Their school moms organize clothing drives for us; they even help with the sorting and shelving of the items; they organize drives to help us with food and gifts for families at the holidays. The Columbiettes are busy contributing all year long – bags of hygiene items, holiday baskets and more. Immaculate Conception runs a Souper Bowl party each year, resulting in hundreds of cans of soup for us. St Therese organized a huge diaper drive for us a couple months ago. Immaculate Conception and St Therese also provide us with funds. We have volunteers that are members of Grace United Methodist, Little Chapel on the Boardwalk Presbyterian, Goshen Baptist, and St Nicholas Greek Orthodox to name a few. Little Chapel gives us funds and they often bring in donations of clothing and household items as well. The Agape Circle from Grace United often brings in cash donations, brand new items of household goods and year after year they bring in brand new toys for us to share in our Christmas room. The United Methodist women recently invited me to visit and presented me with a check. This is just a sampling of the ways we are supported throughout the church communities – I surely have not named them all. These are all relationships that were built through the years since we were founded by Sr Isaac. We are blessed to have their continuing support as we carry on with our mission to serve needy men, women and their families by offering a hand up, not just a hand out.